In the present time of intense competition, it is natural that engineers are trying hard to optimize the use of every resource to reduce costs. In Metalizing, Evaporation Boats undoubtedly contribute most in variable cost. It is therefore important that maximum life is derived from Evaporation Boats without affecting the quality of Metalizing. Based on my knowledge of Engineering, experience of nearly 20 years in vacuum line and interaction with actual users, I have compiled a list of measures which if implemented can ‘enhance’ the life of Evaporation boats by about 25% so that you get your money’s worth out of it. 1) Initial heating of the new boats also called “break in” must always be slow to get proper life from Boats. Reason? New boats will always have some absorbed moisture. If the boat is heated quickly in this condition, the moisture, converted into steam having much higher volume will have little time to escape and can cause cracks because of high pressure build up. 2) At the end of the cycle it must be ensured that all the Aluminum or any other metal being metalized has evaporated completely before heating is switched off. Otherwise residual metal will seep into the pores of boats; now differential cooling rates of boat and metal will crack the boat. 3) Care must be exercised that before the vacuum is broken, boats must have cooled down. This is because sudden contact with cold air can cause boat breakage. About 5 minutes is enough for boats to cool down. 4) Worn out copper clamps also are a big reason for boats not performing to their full capacity. Non uniform wear of clamp causes sparking between clamp and boat; this overheats and cracks the boat. A) Offers no resistance to the flow of current. C) Enhances the life of Boats. 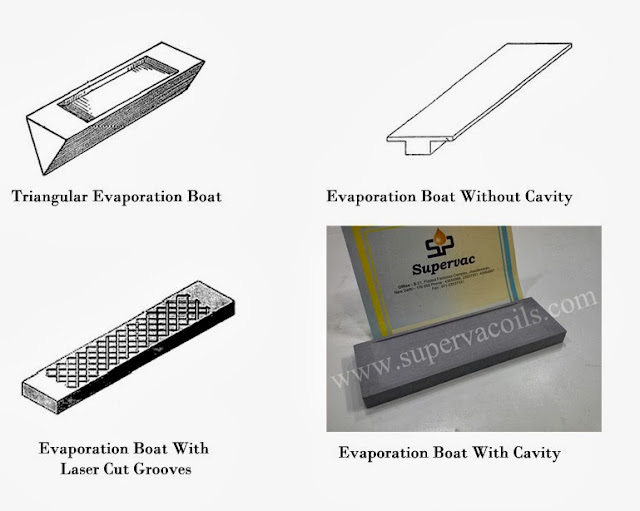 6) There is one more major factor inter linking the life of evaporation boat with graphite foil. 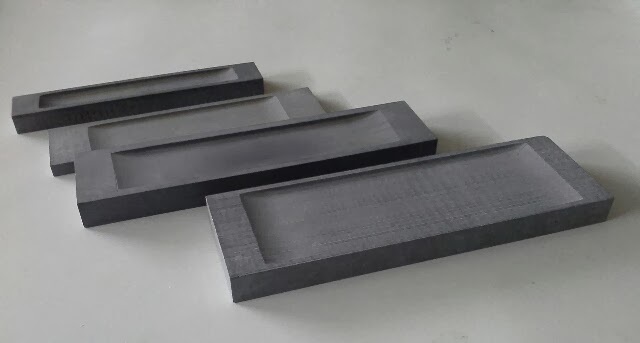 Good quality graphite foil has good compressibility. This allows a proper electrical contact in boats and clamp before heating begins and expansion of boats in heated condition. 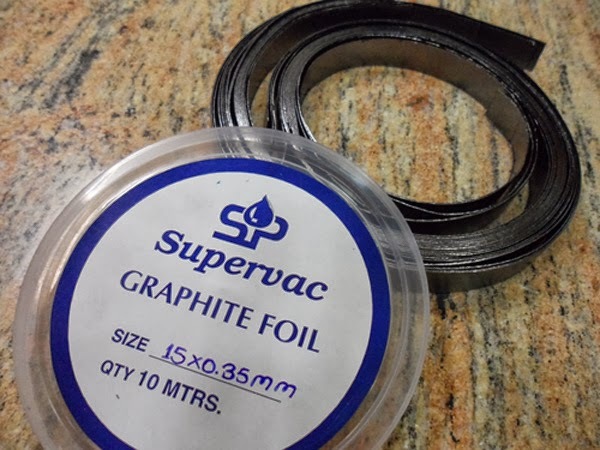 Poor quality graphite foil on the other hand will not allow expansion of boats in heated condition putting additional stress and subsequent breakage of boats. 7) Aluminum of purity 99% or more is required to avoid premature cracking. Impure aluminum will have impurities which will have different boiling temperatures; this will lead to an unstable pool of metal in boat cavity. This in turn results in non uniform heating of Evaporation Boat leading to thermal stress and breakage. 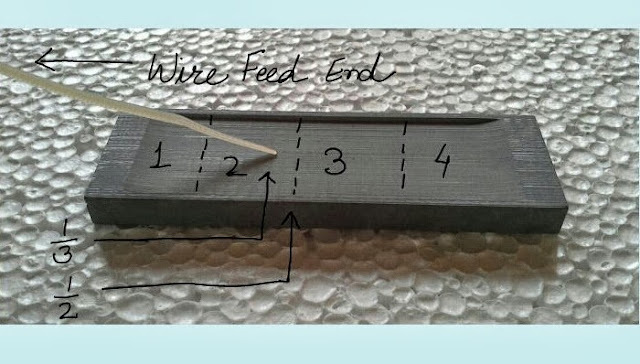 8) Age of aluminum wire also affects boat life. With age, aluminum oxidizes and Aluminum oxide thus formed causes spitting and excessive heating of Boats. Freshly made or “cleaned” wire works best. 9) Hardness of Aluminum should be maintained in proper range if required by tempering as a very hard wire is likely to puncture the boats. 11) Feed of aluminum wire must be regulated to ensure that some aluminum is always available as molten “pool” on the surface of Boat. This makes sure that boat is uniformly heated and increases the life of boat. 12) Power to boat must be so regulated that aluminum melts just before touching the boat , otherwise it will cause an indentation in boat cavity, hastening the failure of boat. 13) It has been observed that Boats made of Titanium Diboride and Boron Nitride (also called 2 components or dimet) work out to be more economical than boats where Aluminum nitride is also used in addition to the 2 ceramic powders mentioned above to reduce the cost. Three component boats, though cheaper in cost, have a markedly shorter life. 14) Experience shows that normal rectangular boats with cavity work out cheaper then Triangular or elliptical boats or boats without cavity or laser grooves on surface. 15) Good quality boats, manufactured by reputed companies like Supervac, having density of the order of 98% of theoretical density have very low porosity. This reduces aluminum seepage in boats and enhances life of boat. These boats work out much more economical than those supplied by phony “importers”/ unknown companies having no quality standards. 16) Contrary to popular myth, using boats with initial resistivity higher then recommended by manufacturer does not give more life. In fact this wastes power, causes overheating and premature cracking of boats. 17) Experience proves that spring loaded end support for boats works best for optimizing the life of boats as it provides a proper contact and allows expansion of boats on heating. Points mentioned above are quite easy to implement and best of all do not cost an extra rupee. This however can result in a saving of about Rs. 9, 00,000/- per year per metallizer (a typical metallizer uses about 300 boats per month, costing about Rs.1, 000 per boat. Saving is 300 x12 x1000 x25% = Rs.9, 00,000/-). This is not all; implementation of these actions will also lead to better metalizing quality, better maintained plant and saving of costly power also.